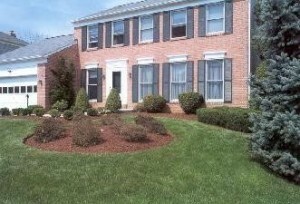 Check out the following Spring Lawn and Garden Tips by Moyers Lawn Service and Landscaping. The snow and ice have melted, but this winter’s wild storms have left yards in need of a major spring-cleaning. Here are some ideas for how to begin. Rake dead leaves and twigs. Cleaning up the leaves and other debris in your yard is extremely important. Last year’s leaves will keep the grass from absorbing sunlight. Thoroughly rake the yard and garden beds. This debris may be a safe harbor to overwintering pests that may cause harm to your ornamental plants. Pruning - Prune back weather worn bushes and hedges as well as any perennials that look overgrown. Trim damaged tree limbs and branches that you can reach, and make arrangements for a professional tree-trimmer to take care of the rest. How about the Lawn? Once the beds are cleaned out, it's time for the lawn. Check to see if you have too much thatch. If thatch is a problem, then you can use a power thatcher to remove this debris. Don't put down any pre-emergent crabgrass control until you rake or thatch. If you put it down first, it will be rendered useless by the thatching. If you have bare spots, then you will want to aerate and or slice these spots and over seed. You know a healthy lawn when you see it: a smooth, lush green carpet. Your lawn needs three things - sun, water and fertilizer. Another important item that is often skipped is testing the pH of your soil. Do-it-yourself test kids are available from nurseries and catalogs. It might seem like a hassle, but testing your soil will save you money. A lawn with an improper pH is unable to absorb the nutrients necessary and thus compete and thus create conditions friendly to weeds and disease. Also, you will want to check for compact soil. If necessary, then you will need to loosen the compaction. Make sure you lawn is properly graded to prevent pooling. Check your lawn and bed areas to see if any grading work is required. Mowing – Your Lawn’s Haircut - Mowing height is extremely important. Most people mow their lawns way too short, which stresses out the grass. Raise the mower to the highest possible notch so you're mowing only the top third of the grass when you cut. Taller grass promotes better root development as well as shading the ground so it doesn't dry out as fast. An added benefit: the taller grass blocks the sun that weed seeds require to germinate. Mulching - Make sure you do not have too much mulch in your beds – it can build up over time and smother plants. If you do, then remove all the old mulch and replace with new. Be sure to clean out the beds around the bases of trees, too. Map out landscaping and garden plans. If you’re going to make any changes to your current landscaping, make a sketch of your lawn indicating what sort of trees, shrubs, or plants you’d like to add. It’s always a good idea to consult with a gardener or landscaper before making any final decisions or purchases. Start planting. Check the planting dates on your new purchases. Any plants, trees or shrubbery hearty enough to survive early spring’s still-cool nights can be put in the ground now. The Best Lawn & Garden Tip – Why not hire Moyers’ Lawn Service & Landscaping to help you out. We are experts. We know what they’re doing and they do it well. And best of all After hiring our company you’ll be able to spend this time doing other things, like catching up on your reading or getting back in touch with an old hobby or new avenue of creativity! Most importantly, you’ll have more time to spend with family and friends! Call today at 301-251-9822.